I recently had two cousins come visit us in Chicago, a wonderful time for me but one that had me wondering what I could make them for breakfast each day. Making dishes I can’t eat any longer because of my angioplasty, such as bacon and eggs or big stacks of regular pancakes or waffles, is a painful experience for me and one I would rather avoid. Luckily, they understood this and also have some dietary concerns of their own that meant they weren’t expecting such classics. Rather, I went low-salt and low-fat, as well as low-sugar when it came to what we drank. Breakfast takes on a light tone when you opt for low-fat, low-salt, low-sugar options. 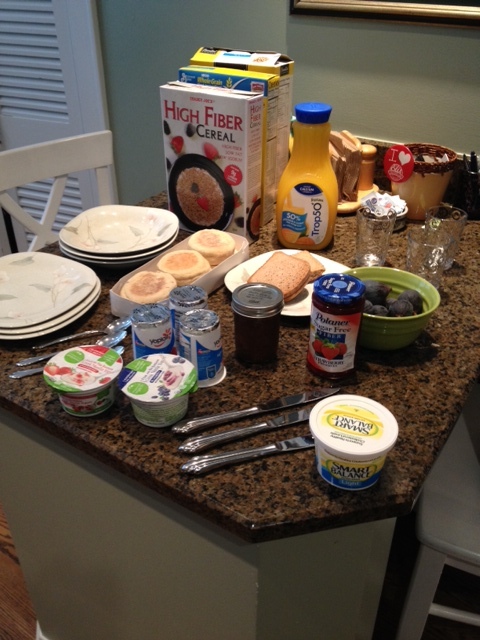 Pictured here is fat-free yogurt (regular and Greek), low-sodium English muffins, low-sugar orange juice, jams, fresh figs and Smart Balance instead of butter. I put out my favorite Trader Joe’s high fiber cereal which is relatively low in fat and sodium. I’ve also found a brand of low-sodium, multigrain English muffins, Healthy Life which taste much like regular English muffins once toasted. To spread on the muffins, I put out some sugar-free jam, another jam my daughter-in-law brought us, and Smart Balance. I’ve largely gotten away from missing butter these days on things like corn or potatoes but if I find any need to have it, I turn instead to Smart Balance on the advice of a nutritionist I saw not long after my heart surgery. I’ve never been a big orange juice drinker either, but not knowing it they were, I decided to buy some Trop 50 which has less sugar than regular juice. I used to buy it for my diabetic mother when she was alive, she loved orange juice and was glad to find a lower-sugar alternative. Also on the table you see in the photo here are fresh figs. I love figs as does my cousin since they were a big part of our youth. It worked out well, I think. So if you’re fretting what to serve house guests for breakfast, relax and go with what works for you on your low-salt, low-fat, low-sugar diet.